Kills: Ants, beetles, cockroaches, crickets, earwigs, rebrats, eas, millipedes, mosquitoes, scorpions, silversh, spiders (including black widows), stinkbugs, ticks and waterbugs. 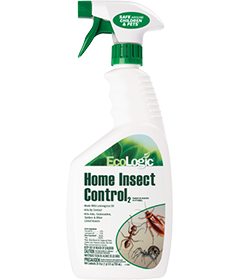 INDOOR USE: Shake well, set nozzle to spray setting and spray directly onto insects until thoroughly covered. Spray into hiding places such as cracks; crevices; openings around sinks, drains and pipes; around appliances; along baseboards and behind cabinets. Spray until wet. Contact as many insects as possible. Repeat as necessary. ooring or painted/stained surface for discoloration before use. Fleas and Ticks: Thoroughly vacuum area to be treated. Adjust spray to create a fine spray. Treat carpeted areas and baseboards of hard-surfaced floors. Test an inconspicuous sample of fabric or rug for staining before use. Evenly apply a fine mist or spray to carpets, rugs, drapes and surfaces of upholstered furniture by using a wide, sweeping motion. Also spray floors underneath furniture, sofas, chairs and beds. Do not saturate surfaces. Treat or thoroughly wash pet bedding, a primary hiding place for fleas. Repeat as necessary. Do not spray humans or pets with this product. Carpet Beetles: Thoroughly spray along baseboards and edges of carpeting; under carpeting, rugs and furniture; in closets and on shelving; and wherever else insects are seen or suspected. In cracks & crevices; around pipes & plumbing; around waste containers; in dark corners of rooms, cabinets & closets. OUTDOOR USE: Remove debris and leaf litter from next to the foundation; cut back vegetation and branches that touch foundation; and move or rake back rocks, deep mulch or other potential pest harborage next to the foundation. Shake well. Set nozzle to spray setting and spray infested areas thoroughly. 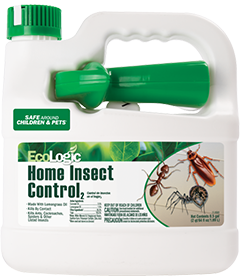 Spray outside surfaces of screens, doors and window frames; porches; patios; and buildings or wherever insects may enter. For ants, thoroughly wet hills and runways. Before using in areas where spray may contact home siding, test in an inconspicuous area and recheck in a few hours. Do not spray directly onto plants or shrubs as damage to foliage may result. Container Disposal: If empty: Nonrefillable container. Do not reuse or refill this container. Place in trash or offer for recycling if available. If partly ﬁlled: Call your solid waste agency for disposal instructions. Never place unused product down any indoor or outdoor drain.